I live in the South. It gets hot in the summer. But hot in North Carolina and hot in south Texas are obviously two very different things. I landed in San Antonio at 7 pm Monday evening, walked out of the airport and my glasses immediately steamed over. "Wow," I thought, "it's really hot!" Taxi driver Eduardo greeted me with a smile, warmly welcomed me to his city and said, "Isn't this weather great?" It's supposed to get hot later this week. At this point, I had two thoughts. First was, "Holy guacamole!" and second was "I wonder if I'll sweat enough to fit into the RITA dress I brought with me?" Who says I don't have my priorities in order? LOL! Thanks to Eduardo, my initial impression of San Antonio was a favorable one that set the tone for what was to be a lovely week in his city. Everyone I encountered; from the hotel housekeeper who cleaned our room (Dolores Q rocks!) to the wait staff at local restaurants to shop owners to river barge drivers/tour guides to people on the street were friendly, accommodating, proud of their city and eager to help. Okay, there was that one taxi driver who got ticked off that we only wanted to go five blocks in his cab but I don't count him. I'm sure he was a transplant from somewhere less friendly. Tuesday morning I awoke refreshed and ready to explore San Antonio with the awesome Kim of the SOS Aloha and Aloha On My Mind blogs. While I was waiting for Kim in the hotel lobby I ran into historical romance author Elizabeth Essex. At RWA, the hotel lobby is a great place to meet and greet, second only to hotel bars. We started chatting about places where we get great ideas and when I mentioned I write entire reviews in my head while in the shower but forget key points by the time I get to the computer, Elizabeth whipped a pad of Aqua Notes (waterproof note pads) from her purse with a magician's flair. This product is my new best friend. Thanks, Elizabeth! We really lucked out when we stepped onto Captain D's boat. He was funny, knowledgeable and made the trip entertaining, educational and fun. Tip: River cruises begin running at 9am. Take the early cruise before the heat becomes unbearable. The River Walk is a calm oasis of lush vegetation, sparkling waterfalls, cozy shops and festive restaurants. It's also the number one tourist attraction in Texas according to the official River Walk website. Most hotels, restaurants and tourist attractions - such as the Alamo - are easily accessible via the River Walk. One of the gorgeous flowers found along the River Walk. It's an optical illusion but check out the cool "flat" Nix Professional Building shown to the left. It's a 23-story hospital on the River Walk that, at the time it was built, was the tallest hospital in the U.S. A bit of trivia: Carol Burnett was born in this building. The Bexar County Courthouse is one of the most distinctive buildings in San Antonio. This historical landmark sits on the Main Plaza along with the Cathedral of San Fernando. Completed in 1896, the red sandstone building is on the National Register of Historic Places. The Cathedral of San Fernando was founded in 1731, is the oldest, continuously functioning religious community in the state of Texas and one of the oldest cathedrals in the United States. In 1836, the cathedral was instrumental in the siege of the Alamo when, according to Wikipedia "the cathedral, still a parish church, played a role in the Battle of the Alamo when Mexican General Antonio López de Santa Anna hoisted a flag of "no quarter" from the church's tower, marking the beginning of the siege." The Cathedral also houses the burial tomb of Davy Crockett, William B. Travis, Jim Bowie and other heroes of the Alamo. Speaking of the Alamo, we visited that too! While at the Main Plaza, Kim and I checked out the Farmer's Market where we met these hardworking folks from the San Antonio Food Bank. If you're on Instagram, check out fitbot3000 for healthy eating tips. They say everything is bigger in Texas...including the animals at the Buckhorn Gift Shop. And, of course, no visit would be complete without a seeing a few cowboys. These two work a couple days at the shop but the rest of the week they're out on the range doing real cowboy work. All that walking around in the heat - believe me, it was hot - conjures up a mighty thirst so I popped into Schilo's German Deli for a glass of their homemade root beer. Having grown up on "real" A&W root beer (not the bottles and cans that can be found at grocery stores), I consider myself a root beer aficionado. I have to say, Schilo's make one delicious root beer! If you're ever in San Antonio, I highly recommend it! After my day of sightseeing, I returned to the hotel for a shower (I don't care what Eduardo said, it was HOT and I was soaking wet by the time I got back to my room) and got ready for my Tuesday evening dinner date with one of my favorite Aussies, Anne Gracie. Anne is one of those people who instantly puts you at ease and it doesn't matter how many years there are between visits. When I see her we pick up as easily as if we had just seen each other a couple months ago. We kicked off the evening with delicious frozen margaritas and followed those with authentic Mexican cuisine at Casa Rio, the first business to open on the River Walk (in 1946) and one of the most photographed with its patio of colorful umbrellas bordering the river. The core of the Casa Rio building is a Spanish hacienda on land first granted by the King of Spain in 1777. Anne and I enjoyed a leisurely dinner and great conversation about a variety of topics, including her 2014 RITA nominated book, The Autumn Bride. If you haven't read it yet, I highly recommend it! The colorful patio umbrellas of Casa Rio. Back at the hotel, I stumbled upon my roommate, Lisa Lin as well as (suspense author) Carey Baldwin, (historical romance RITA finalist) Tessa Dare, (historical romance Golden Heart finalist) Lenora Bell and (historical Romance author) Erica Monroe. We caught up over drinks (Strawberry Margarita, anyone?) before finally heading to bed. I knew I'd need a good night's sleep for all the fun and festivities of Wednesday! Tell me about your latest vacation. Where did you go? How was the weather? Were the people friendly? What were some of the highlights of the trip? Were there margaritas? Have you been to San Antonio? One person (U.S. addresses only) who leaves a comment will receive a package of books and swag from my conference stash. I'll randomly choose a winner from comments left before 12:00 am, EST Saturday, August 2nd. Don't forget to come back tomorrow for the second installment of What Happens in San Antonio! Hot in Alabama and hot in Texas are also two different things! I loved the riverboat tour. I went about 7:00 at night -- still a bit hot but for the most part the sun was behind the buildings. Did your captain tell you that the color of their hatband signifies how long they've been driving boats? Red is the longest so you had a seasoned veteran. And did your's tell you about how they moved the Fairmount Hotel so they could build the Marriott Rivercenter on that spot? There's a video on YouTube about it. And the little amphitheater at La Villita was used in Miss Congeniality. There's also a scene shot at the Alamo. Anyway, I just loved the city and its people. I'd love to go back -- in the spring or fall. LOL! 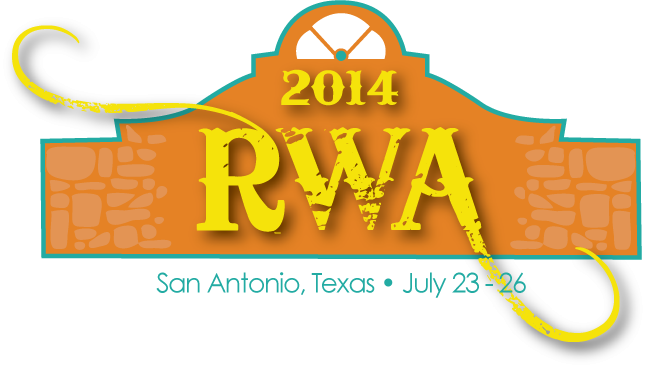 RWA 2014. San Antonio. HOT. Yes! As friendly as only romance novelists and professional tourist staff can be. Highlights: meeting Eloisa again and being greeted as not a newcomer but someone great to see again; meeting Teresa Medeiros for the first time (SQUEE! ); meeting Kristan Higgins for the first time (and stalking her for about three other 'meetings'); going to classes and learning new things; meeting great, wonderful, gracious people who are all eager for me to finish my book...it was such a good time. And I had a prickly pear margarita, from a party we crashed in the Riverwalk. *LOL* And I absolutely loved seeing the Alamo. Lovely. You saved me at the conference. THANK YOU. Thank you for the vicarious tour, PJ. It makes me long to visit San Antonio. If I ever make it to nationals, it will be the promise of meeting some of my favorite people face-to-face that lures me there. My summer vacation has been a lazy one at home, but I plan to head the mountains of Tennessee, one of my favorite places, once fall arrives. The mountains of Tennessee are gorgeous, Janga and fall is the very best time to visit! I hope you do make it to a RWA conference one of these days. You'd have a wonderful time! An enjoyable post with wonderful photos. I would like to visit San Antonio.My last vacation was at a beautiful Florida beach which was relaxing and delightful. The setting was ideal and the town charming and the people friendly. I would return. I have staycations lately. never been to San Antonio. Having been out of town for most of July, a staycation sounds really lovely! I have never been to San Antonio. Love too. Planning a holiday would be great. Not yet though. Your feature is very special. I've enjoyed several trips to San Antonio. One of my favorites was the year I gave Hubby a weekend in San Antonio for his Christmas gift. We saw a traveling museum exhibit he was interested in, stayed at La Mansion del Rio, ate lots of good food and had a great time. Other highlights from San Antonio trips include touring the Alamo, attending mariachi mass at San Fernando Cathedral, walking along the River Walk, going to Fiesta Texas and Sea World, and watching the New Orleans Saints beat the Houston Oilers in the first NFL game played in the Alamodome. Glad you had a good time! Sounds like a wonderful Christmas trip for your hubby! I went to a party and a dinner at La Mansion del Rio. It was lovely. Very "old San Antonio." I haven't been to San Antonio. I would like to go sometime, but not in the summer! In May we went on a wonderful trip to Ireland, Wales, England, and Scotland. The weather was cool and rainy, but the people were warm and friendly. Scotland was my favorite. Hi PJ! It was great sitting with you and all the other wonderful authors at the lunch on Thursday. I enjoyed your post. It helped keep the conference glow alive! Have a great week! I'll have post-conference blogs running all week. It helps keep the glow alive for me too! Thanks for the post and pictures. I don't know if I would have survived the heat. Was the temperature high or was it the humidity? Kim, unfortunately, it was both heat and humidity. Luckily, we spent most of our time indoors but even there it wasn't as cold as it usually is at other conferences. My last vacation was to Denver and it was great, the weather was perfect. I have been to San Antonio and stayed at the Marriott. I loved it. Of course I was there in February so it wasnt that hot, weather then is perfect. I haven't been to Denver yet but I hear it's great. Aloha, PJ! Thank you for sharing your day with me! Funny that we have almost the same pictures! LOL! I noticed that, Kim. I think it's because we both stopped to take photos at the same time. You have the lovely interior shots of the Cathedral of San Fernando though. I didn't get those. Hope you had a good flight home. We ended up spending most of the day sitting in the airport and got home five hours later than originally scheduled. Haven't been on a vacation in a while but I have really been enjoying all the highlights from the conference. And thanks for all the historical facts too. It's all very interesting. I've never been to Texas - maybe some day! Don't go in the summer! lol! The last time I visited San Antonio, I was 18? so many moons ago!!! My aunts still live down there and I keep meaning to visit again. Thanks for the fun post!!! Glad you had a great time! We haven't traveled very far in a while but your trip looked and sounded wonderful. Thanks for sharing the great pictures & memories! I haven't been to San Antonio, but I was in Dallas about 35 yrs ago! LOL! We haven't been on any vacations lately, but I hope to get to the Bronx Zoo & the Metropolitan Museum of Art before the summer is over. Maybe next year we can take a week. Would love to go back to Disney before my daughter is out of school. My last trip was in May to New Orleans for RT conference. The weather was unseasonably cool and fabulous. Highlights were brunch and dinner with some of my favorite authors and friends at the Court of Two Sisters, my favorite restaurant in New Orleans, the Ruby Slipper and a carriage ride through the French Quarter. I have not been to San Antonio, but would love to go when it is cooler. PJ, loved your post and pics today, and enjoyed the updates on FB. We didn't really have a vacation this summer, but did go to Lubbock, TX for my SIL's wedding. The weather was nice and way cooler than normal temps in June. My new BIL's family is really nice, and loved their Canadian accents. Know what I mean, ay? My husband, daughter, and I went to Padre Island two summers ago. Wow, Corpus was really, really humid. But, loved the island, the beach, the waves of the Gulf. Perfect. We toured The Lexington, and the guides were friendly and chatty. We really want to go back....or head to Lake if the Ozarks as an alternative. So happy you had fun at RWA, and shared it with us. I should clarify that my BIL Abe is Canadian, but has lived in TX for almost 30 years. Awesome post . I loved the recap and photos so much. You are amazing ! I spend most vacations helping my folks in Florida but working on a Scotland trip for next year. It sounds like your RWA trip got off to a good start. I am actually on my way home from a trip to Northern New York and New Hampshire. I attended my high school reunion and spent a couple weeks visiting friends and family. I then met my husband and grandson in New Hampshire where we spent a week in the mountains. We drove downstate to visit my husband's relatives. One day we drove to the coast to visit a friend and have lobster. We went back to Northern New York for my father's 90th birthday. We had a nice party and saw many family and friends we have not seen in a long time. A few more days of visiting and now we are headed home. Will get there tomorrow. We went to San Antonio almost 3 years ago. We ate at the same restaurant you did. We visited the Alamo and the state museum. We didn't get to do much a hope to go back soon. For my last vacation I went to California for Thanksgiving. My sister and her family rented a cabin up in the mountains and one of the highlights of the trip was the hike I went on with a friend where we got lost and walked forever uphill, miles out of the way. I sure got my exercise that day. It was wonderful being with my family and we had a great time and I got to see a few friends while I was in California as well. There weren't margaritas, but there was pumpkin pie and that's even better. :D Yes, I've been to San Antonio. My son and I stopped off there to visit SeaWorld on my move from California to Florida ten years ago. We spent a month on Daulphin Island, AL this year... and it was lovely.... but we're more bourbon drinkers than margaritas. Going to Colorado Fri to see our son. It is lovely there. Last trip was in March to Fla - to visit friends. It was wonderful as always. Don't care for margaritas - like the banana pina colada. Never been to Texas - hear the Riverwalk is wonderful; on our visit list. Going out west soon to visit family and in the winter Aruba with my inlaws. Cannot wait. Last trip was to Crayola Land - I have a 5 yr old. Prefer a glass of wine or beer to a mixed drink. Never been to Riverwalk but have heard it is a sight not to miss. Hi PJ, looks like you did almost the same sightseeing as our German trio (my editor friend, my sister and I) did when in San Antonio. Looking forward to more pictures and reports. I hope you had a better flight home than my sister and I had. After our overnight flight via Detroit (we had left San Antonio on Sunday at noon), we got stranded at Amsterdam airport for 24 hours, where we had to stand in line for 10 hours at the KLM transfer counter without food and drinks and had to spend the night on cots in the terminal. We finally got home to Cologne on Tuesday morning - by train - after ten a.m., almost exactly 24 hours later than scheduled. Now it's Wednesday afternoon and I still haven't gotten our suitcases. I will be heartbroken if all the books I got at the signings are lost or damaged. So at the moment I don't want to think about travelling ever again. (Don't enter me in the contest ;-), as I don't live in the US). My last vacation was in San Antonio but it was almost a year ago. I did some of the same sites you did but missed some that I wish I had know about. Looks like you had a great time PJ! How could you not hanging out with such a great group of ladies! I just came back from vacation a couple weeks ago from Wildwood Crest, one of the best beaches of the Jersey Shore. We just love it there and have been going for years. There is nothing more relaxing then sitting on the beach with a good book and some home made Sangria. I also just came back from a Girls Weekend in Atlantic City where of course there was more Sangria! I'm on my "extended" vacay in the Grand Canyon state. What surprised me was the day I arrived it was snowing heavily, not what I expected to see in a 'desert' state. Boy! was I wrong?!?! I saw more snow last winter here than when I was in WA, the temp could easily drop below zero and bone shattering cold at night. During the day, it's dry desert heat most days in the 90F, strong wind (we're talking 30-50 mph) is common and often here. The highlights of this trip? Travelling into the "Rez" all by myself was never in my plan or in my wildest dream, but I did it, into the Navajo and the Hopi land..... and I've met the most wonderful people here, they're very friendly, kind and generous to a clueless tourist/stranger like me. Fascinating places, cultures and people. Now, I got to live on the Navajo Rez with my "adopted" Navajo (big) sister (we adopted each other), I try to learn the "Diné" language a little while I'm here, her (very extended) family is a lot of fun folks, and easy to laugh bunch. I will miss them when I leave. No margaritas, and never been to San Antonio. But I'd been to Dallas though (back in the 80s), it'd just snowed that morning when I arrived. I am an elderly lady so I don't travel any longer. Never been to the Riverwalk. Many years ago enjoyed going to Canada with family to see my grandson graduate from med school and went to Calif to see my daughter and famil and also met her with her husband in Vega. I enjoy reading, watching political shows, baseball games - The Yankees - Dancing with the Stars, The Idol and reading the newspaper from cover to cover and love to cook. I have 2 little boys so our vacations are quite limited. Our latest was to Gettysburg. My brother and I love anything to do with history so being at the battle field and learning more about that part of american history was a lot of fun for us... My kids liked looking at the old cannons and the monuments. It was hot and a bit humid, the people were friendly we had a tour guide come into our car with us and he was awesome and knew so much about the battle :). Great pictures, PJ! My iPhone never recovered from the accidental soaking I gave it so I don't have many photos. So nice to see yours. It was so lovely to catch up with you and to keep saying "hi" during the conference. I so agree with you - San Antonio is a wonderful place, I couldn't fault it! Have not been to San Antonio. went to Fla 3x this year - latest trip. Weather fine, no margaritas. Been on a river cruise in Europe and Ireland last year. Flight delayed, that was only mishap. And yes the people were friendly. And I would love to win a pkg of books. I've never been to Texas but both of my brothers spend time there while in the Armed Forces. They both said what everyone else says: Yes, it's hot, but it's a dry heat! I could never figure that out. 100 degrees is 100 degrees, dry heat or not. So you tell me...how does 100 degrees in Texas differ from 100 degrees in South Carolina? Sounds like you had a great trip. Love looking at your pictures. Last trip was in Maine very recently. Was a family thing so we had a great time relaxing and walking around the town and shopping of course.Weather was great. Like I mentioned, allergic to alcohol so iced tea for me. Have not been to San Antonio, but friend wants to go and do the riverwalk thing. So maybe sometime in the near future. Right now am laid up with an Achilles tendon problem. I have a two year old and a five year old, so travel isn't the easiest or most enjoyable thing these days. Other than an overnight trip to neighboring cities, I haven't been on a vacation in years. BUT I do have a 10 day trip, with my best childhood friend, planned in October. It's going to be fantastic! I doubt there will be margaritas, but I am looking forward to the ales and whisky! In January my husband has a conference in San Antonio, so I'll have the opportunity to visit the city and the River Walk. It should be a great trip! I'm a homebody no vacation for me.but when I'm out with my friends.I enjoy a cold beer. Last trip was visiting family and friends at SC and NC - weather good, had a nice time. People were friendly, even the family. LOL. Weather beautiful. Going to St Kitts very soon. I went to Assateague Island Maryland for the beaches and wild horses. Loved every minute. I'll be back.